This ride combines all the most delicious and scenic moments of the Great Taste Trail into one memorable trip. On this ride, you can enjoy the easiest wine cycling on the Great Taste Trail, so if you want a relaxed day visiting the vineyards on the plains, this trip is for you. As well as the wineries, it offers a chance to explore historic rural landscapes around Brightwater and Wakefield, the coastal sections with a fabulous swimming beach and the foodie village of Mapua. Beyond Mapua, the trail passes through the heart of the apple country, which is peppered with trail side fruit stalls in the summer time. The route ends on the golden shores of Kaiteriteri – gateway to the Abel Tasman National Park. The new Spooners Tunnel section of trail can be added to day one of this itinerary. The first leg of your trip follows the Great Taste Trail Rail Route to Wakefield. Before you leave the urban area, you might want to call at McCashins Brewery, Kitchen & Bar for some refreshments. This is the easy, flat, wine cycling day in the densest area of wineries on the whole of the trail. The wineries here are small and generally family-owned. Not all vineyards are open 7 days so check our map before you leave. Brightwater Vineyard is on the route and this vineyard won the Air NZ Trophy for their Pinot Noir in 2015. Beyond Brightwater, the trail continues 8 km to the charming historic village of Wakefield. The last section of trail through to Wakefield is likely to be your favourite section, as the countryside here is dotted with pretty rural buildings and large trees. The new Spooners Tunnel section of trail can be added to the route today. This Spooners Tunnel section of trail is due for completion early 2019 - please check our news page for more information. Todays ride starts by re-tracing your route on the Rail Route as far as Brightwater. From here, there are two route options: one takes (mostly) quiet country roads across the Waimea Plains (28 km). The other retraces the Rail Route back to meet the Coastal Route and on to Rabbit Island (38 km). The Coastal Route then follows around the edge of the estuary (with interesting coastal bird life), with boardwalks and pretty reedy sections, before emerging at the beachfront at Rabbit Island. Take a break on the beach here before continuing on pine forest trails to the ferry landing for the short trip across the channel to the Mapua Wharf, bristling with cafes, galleries and a small, beautifully landscaped beachfront park. Enjoy the evening relaxing on the wharf – there will be a few choices of cafes for dinner here tonight and we are happy to make a booking for your group. We recommend you consider two nights in Mapua, allowing time enjoy this arty, foodie village. Take time to wander in the village, visiting the galleries, shops, wine bar, brewery and cafes. Or follow the locals to the estuary for a swim at high tide (or take your lead from the kids who prefer to jump off the wharf). There is plenty to fill a relaxing rest day here. Please request the “Linger Longer in Mapua” version of this itinerary at time of booking. Today you are riding from Mapua to Motueka. This intermediate grade leg has some hills but there are great views too. Leaving Mapua, the trail follows the coast before heading inland, with steepish climb of approx 1 km up onto an elevated route above the coast. This is apple country, so look out for the orchard packing sheds and interesting little workers cottages tucked amongst the apples trees. Leaving the village of Tasman, expect a slow climb of around 3 km up to the Moutere ridge. The next gravel section (4.5 km) climbs and descends as you follow the ridge (elevation approximately 110 m.) It’s not a long section so take it easy and enjoy the views. There are three authentic “Nelson-style” cafes on your route today, with interesting gardens and great food and coffee. There are tame eels at one cafe – watch those teeth – and another is on the site of Riverside Community, with a fascinating cactus garden. 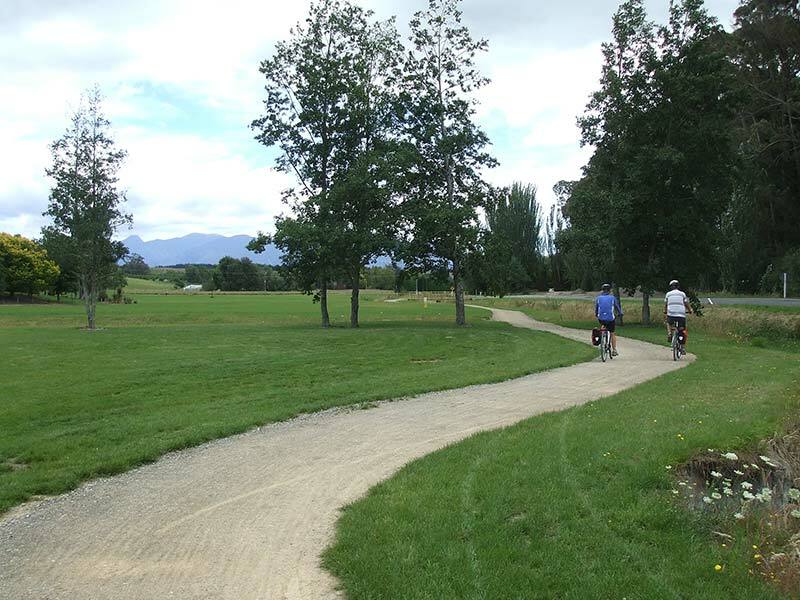 The section of trail through Motueka avoids the town centre and follows around the estuary waterfront, past gardens and grassy beach reserves. Look out for the open air Saltwater Baths and the old wharf. Motueka is bustling during the fruit-picking season and pretty sleepy the rest of the time. It’s just a short ride to Kaiteriteri today and it’s flat – until the end. Following the wine cycling of previous days, today is “honesty box” cycling, so expect some fresh fruit (in season) including apples, pears, nashi, grapes, feijoas, citrus and melons. Leaving Motueka the trail heads to Riwaka, a cute little village which is home to a great cafe and a craft brewery, so plan to stop there! After Riwaka, there is a section that goes right through a kiwifruit orchard before the trail rejoins the coast. The trail then climbs and drops beside the road for a section before ducking into the Kaiteriteri Mountain Bike Park. This last section of 3.1 km is intermediate grade and takes the Easy Rider Trail through the bike park. The surface here is smooth and it is not technical, but you might want to take it very gently as there are some tight corners and some riders prefer to walk. As the trail winds down through the bush and pine trees you will soon get your first glimpse of your destination – the stunning golden shores of Kaiteriteri Beach. The beach here is the departure point for boats travelling into the Abel Tasman National Park. All our We Love Nelson packages include packages include door-to-door return transport from Kaiteriteri, bringing you and your bikes back to Nelson. Why not add a day trip in the Abel Tasman National Park to your cycling holiday. This extra night option includes a night at an Eco Resort in Kaiteriteri – the perfect way to relax at the end of your cycling trip. The following morning it is a 10 minutes walk down to the beachfront where your Park Day begins. Book your full day Wilsons Abel Tasman trip with us (standard retail prices apply) to receive a complimentary light picnic lunch. Prices start at $82 adult for an Open Day Pass. Please request the “Kaiteriteri Overnight with Park Day” version of this itinerary at time of booking. Includes 4 nights en suite accommodation, twin share. When you email us we will reply with a bunch of questions which will provide all the information we need to provide a quote for you. For “All Sorted” packages, we will reserve accommodation at time of quoting and this will be held until you confirm.